July 2017 / September 2017: The mayors of the world’s 25 largest cities are each responsible for more people than most national prime ministers. For example, London, ranked 23rd in the world, has more residents than nations like Paraguay, Denmark, New Zealand or Ireland, and if Shanghai, globally the largest city, was a country it would rank just below Australia but above Chile, the Netherlands or Greece. The combined population of the world’s 19 megacities - cities with more than 10 million inhabitants  is greater than that of Brazil, the world’s fifth largest country. These are some of the findings of the City Mayors 2017 survey The world’s largest Cities and their Mayors. According to the survey, there are 19 megacities in 2017. In addition to the world’s three largest cities, Shanghai, Beijing and Karachi, Istanbul, Dhaka, Tokyo and Moscow all have populations of more than 13 million. There are three cities, Jakarta, Cairo and Mexico City, with populations of between 9 and 10 million. Only 21 cities of the largest 300 cities of the world have populations of less than one million. The survey’s ranking of the largest cities is based on the population of actual cities and, although providing the data, does not include people living in adjoining metropolitan areas. If greater metropolitan areas were taken into account, some additional 20 cities could claim megacity status. For example, Lagos with a population of 8 million is part of a metro region of some 16 million people. Cities with a populous hinterland also include, Jakarta, Cairo, Mexico City, Teheran, London and New York City. The job of running a big city is one of the most arduous tasks imaginable. The survey The World’s largest Cities and their Mayors names the men and women who perform it. Of the world’s largest 300 cities only 25 are governed by women, although a number of European capitals, including Rome, Madrid, Paris, Warsaw and Stockholm, have women mayors. The world’s most powerful woman in local government is Yuriko Koike the Governor (Mayor) of Tokyo. Other influential female city leaders include the mayors of Sydney, Surabaya, Havana, Perth, Barcelona and Cape Town. 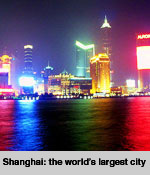 China and India have the largest number of cities in the top 300 - 44 and 28 respectively. Other countries with strong representation include Brazil (14), Russia (13) and the USA (9).